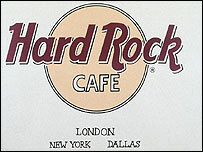 The Hard Rock Cafe in central London has been damaged in a fire. Eight fire engines attended the blaze at the seven-storey restaurant in Piccadilly near Hyde Park Corner, a London Fire Brigade spokeswoman said. She said ducting was alight from the ground all the way up to the roof causing extensive damage to the ground floor of the building. No casualties were reported and everyone was said to be accounted for, following the incident. The fire took place as emergency services struggled to recover victims of this week's bomb attacks in London.